Mike Hutton is a climbing and travel photographer based in the Peak District. He has been a climber for 20 years and a landscape photographer for 8 years. Over the last 4 years he has combined his love of climbing with photography and now concentrates on photographing climbers all round the world. What is your favourite/most iconic climbing shot? 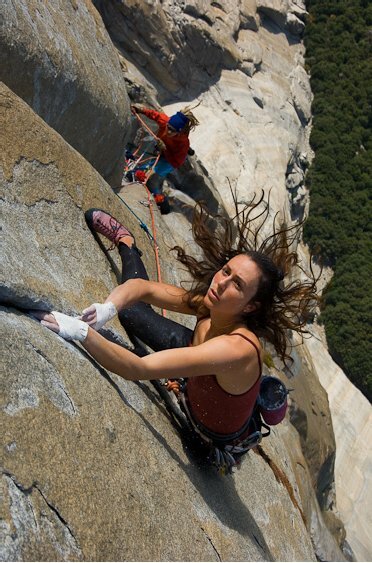 Not iconic as such, but I like Jimmy Chin’s shot of Steph Davis on the Salathe wall. The hair is moving and she has chalk on her face. The belayer looks busy too. It’s also capturing quite a historic moment. What has been your most rewarding climbing shoot and why? Must have been the day me and Martin Kocsis went to take a photo of him on “Consolation Prize”, an unprotected E5 arête at Wimberry. The route faces North East so an early start was essential. After several 5am starts with no results and me falling asleep at work the weather Gods did their stuff. We arrived in the dark and because there were just the two of us, I could only spot him on the crux. It was hard abandoning him for the camera, but he looked steady enough. We were blessed as the rock glowed like amber and a mist inversion had just developed in the valley floor. Its days like these that make it all worth while. Seconds later the shots were in the bag and he was engulfed by the Chew Valley mist. You will understand when you see the photo in the new BMC Moorland grit stone guide. What is currently your favourite bit of kit, and why? It has to be my Canon radio-activated shutter release. The camera can be framed up on the climber 50m away. It’s then possible to activate it whilst you are belaying or even climbing a route yourself. What is your most used lens for climbing photography? The Canon 24-104 L image stabilizer. Not brilliant at the extreme ends, but does a bloody good job in most situations, particularly when weight is an issue. If there is a problem with the image it’s generally not due to limitations of the lens. The Canon 17-40L is pretty good too but some girls don’t like the way it distorts their hands. What route, location or climber would you most like to shoot? I would like to photograph one of my mates on the longest ice route in Norway. It’s 15 pitches of up to WI 6 and could make a sparkling image with the right lighting. They had better get good enough to climb it. Location has got to be the Blue Mountains in Australia. The lines are long and on great coloured rock with splendid scenery. The possibilities are endless. I’m not really bothered who I photograph so long as the experience is good for everyone involved. It’s been rewarding photographing some top end climbers. Watching the way they tackle moves has benefited my own climbing. What piece of advice would you give to anyone wanting to make more of their climbing photography? Listen to the experts and absorb as much free information as possible. Ultimately you just have to get out and do it. Never leave your camera at home. I nearly didn’t take mine with me recently. Whilst on the way to the Kendal Mountain Festival I decided to turn around and make for the roaches. A mist inversion had developed and there was a lone person bouldering. The result was one of my best photos to date. Remember to value your work and if it’s good enough for publication don’t put it all over the web for free. This is an instant fix and will ultimately de-value other photographer’s work including your own. Be sensitive to the feelings of the climbers you are working with. If you are lucky enough they are your friends and you will understand them well. 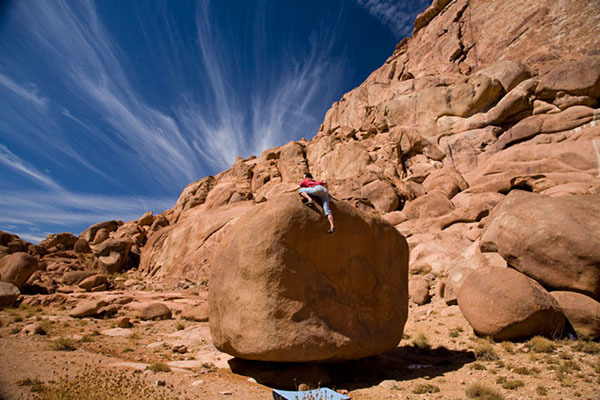 Nic Flemming on No way down ,Sinai, Egypt. 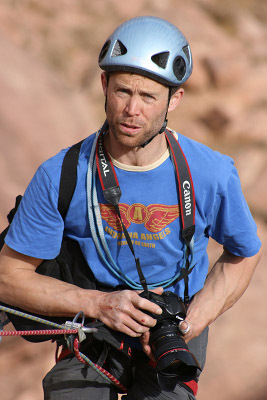 Many thanks to Mike for sharing his time with the Climbing Photography blog. We were introduced at the Kendal Mountain Festival in 2010 – it continues to be a great place to meet people. Cheers Mike. If you’d like to comment on this post, or share your own iconic climbing image please drop us a line below. 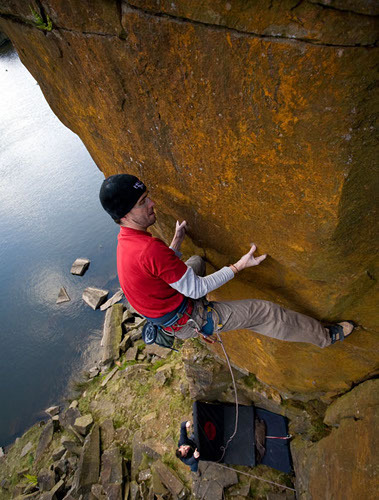 Previous post: 5 Great gritstone climbing photos to shoot from the ground.